International soccer bodies, in violation of their own bylaws, have ignored the blatant mixing of sports and politics in advance of this month’s Egyptian presidential elections that general-turned-president Abdel Fattah Al Sisi is set to win after ensuring that no credible candidate would challenge him. Despite recently warning Saudi Arabia and Iran that “politics should stay out of football and football should stay out of politics,” world soccer body FIFA president Gianni Infantino and his Confederation of African Football (CAF) counterpart, Ahmad Ahmad, have been conspicuously silent about Mr. Al-Sisi’s marshalling of Egyptian soccer behind his candidacy and use of a state-owned bank to persuade Egyptian players not to accept lucrative contracts in Qatar. Egypt is part of a United Arab Emirates-Saudi-led alliance that eight months ago imposed a diplomatic and economic boycott on the Gulf state. The Asian Football Confederation’s (AFC) insistence, in line with international sports associations’ ban on the mixing of sports and politics, that home matches be played on home ground despite the rupture in relations, has turned soccer into the only sector to have breached the boycott. Saudi, UAE and Qatari teams are forced to travel awkward routes for Asian competition matches because of the cutting of airlinks between the protagonists. Several potential challengers in the Egyptian election, including senior military figures, have either been arrested, forced to withdraw their candidacy, or decided not to run because of the risks involved. Controversial member of parliament and head of storied Cairo club Al Zamalek SC Mortada Mansour withdrew his candidacy in January, saying he would explain why at some later date. Mr. Mortada’s withdrawal prompted a last-minute race to find a non-threatening challenger who could muster the endorsement by at least 26 members of parliament and 47,000 voters in time to meet the nomination deadline. 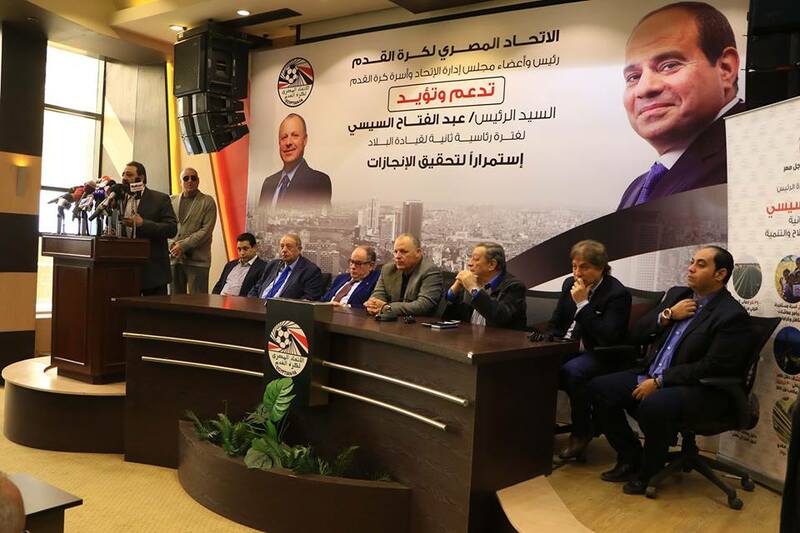 Mousa Mostafa Mousa, a largely unknown politician who had earlier declared his support for Mr. Al-Sisi, registered 15 minutes before the deadline, ensuring that the government could claim that the election would be competitive. Mr. Al-Sisi has at the same time stepped up his crackdown on any dissent and tightened the screws on both domestic and foreign media. The manipulation of the election results and the crackdown calls into question FIFA and CAF governance with the Egyptian Football Association (EFA), several club presidents, and a host of athletes calling a news conference to endorse Mr. Al-Sisi’s candidacy in violation of the principle of a separation of sports and politics. Seemingly convinced that FIFA and CAF would look the other way, the soccer officials and athletes apparently felt confident that their violation of the sports’ governance would not lead to a suspension of the EFA that would have cost Egypt its slot in the 2018 World Cup in Russia. Egyptian soccer’s support for Mr. Al-Sisi, moreover, ignored the fact 210 militant supporters of Mr. Mortada’s Al Zamalek went on hunger strike last month after a military court extended their detention for a month. Mr. Mortada has in the past denounced the supporters as terrorists. The supporters have been charged with belonging to an illegal organization, using terrorism to achieve the group’s goals, possessing fireworks and attacking police. In a separate case, prosecutors have appealed the acquittal of 26 Zamalek militants who were accused of staging an illegal demonstration. Concern about the power of militant soccer fans, who played a key role in the 2011 toppling of President Hosni Mubarak and subsequent anti-government protests that ended only after the rise of Mr. Al-Sisi and his brutal crackdown, has largely kept stadiums closed to the public for the last six years. The government said last month that it would allow up to 10,000 fans to attend domestic league matches in a soccer-crazy country in which stadiums were filled to the brim prior to the ban with tens of thousands creating an electrifying atmosphere. Mr. Al-Sisi has similarly not shied away from using the judiciary and the banking system to pressure Qatar because of its support for the Muslim Brotherhood that he brutally removed from democratically elected office and since outlawed. A Egyptian court fined beIN Sports, the sports franchise of Al Jazeera, the global Qatari television network, for violating competition rules by broadcasting over a Qatari rather than an Egyptian satellite. The EFA, in a similar violation of sports governance, announced a boycott of beIN, shortly after Egypt and the Gulf states declared their boycott of Qatar. CAF warned at the times that clubs could be penalized, but never followed through on its threat. State-owned Banque Misr, in an ostensible bid to stop Egyptian athletes from seeking opportunities abroad, last month launched a fund to create the facilities and environment in Egypt to prepare them for international competition. The announcement came days after parliament called for moves to prevent Egyptians from changing nationality to compete for countries, among which, first and foremost, Qatar. “We are aware of Qatar’s attempts to snare Egyptians. The naturalization of a large number of Egyptian sports talents is part of a political plot,” Tariq Khouli, secretary of the Foreign Relations Committee told Al-Monitor, making clear that sports and politics in Egypt are two sides of the same coin.